In this episode, Joel and Antonia talk about how we have a moment in our lives that we need to change the dynamic between us and our parents. If you like the podcast and want to help us out in return, please leave an honest rating and review on iTunes by clicking here. It will help the show and its ranking in iTunes immensely! We would be eternally grateful! Thank you. I’m going through an extremely difficult parental alienation experience with our 15 year old daughter and this episode really touched me – in that I know I can get through this and that other emotionally intelligent people don’t always have the best outcome every time… and that’s okay. Thanks Antonia, for sharing your story. You have done everything in your power to express love to your parents, and I’m sorry it ended that way. But I’m impressed by your capacity to keep your calm and end it with love. I wish you the best for your future, and know that you’ll always have people all over the world that want to suppport you. I believe that your actions can be a powerful example for all of us out there. 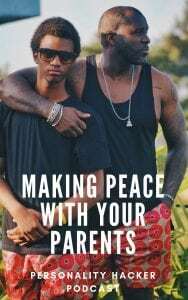 Personally, I think it’s too soon to make peace with my father -I’m 21 years old, my parents have been divorced for 5 years and he still has a lot of anger and blame, so I want to let it rest for a few more years. I already tried reconciliation once after a long period without contact, but it turned out badly. After an awkward conversation, I discovered he’d been lying to me and taking money from an old bank account of mine. He also treated me as if I were still 10 years old, stepping over boundaries and expecting me to obey. Unfortunately at the time I didn’t have the conversation skills to express my disagreement, so I just said nothing. He ended up believing that I was sent by my mother to find out information about him and accuse him of taking money. I know I didn’t act my best, but I did what I could at the time. Perhaps, in a few years, a family emergency will force us to meet, and I’ll be able to talk to him again. As soon as I finish this comment I’m going to listen to the second part of this episode… And probably cry… a lot. So I wanted to write this first before ALL THE EMOTIONS happen. I’ve been loosely following your podcast for probably a year. I’ve never developed a regular habit of podcast listening, so I used to just pick 3-4 of your episodes that jumped out at me as a treat for long drives. Recently I started training for a half-marathon and my long runs gave me a new opportunity for podcast listening (yay!). In August I happened to do a “month of sobriety” and I was right at the start of it, and was picking out one of your podcasts to listen to to get me through 7 miles, and I happened to see “The Drinking Episode”. I’m a big believer in synchronicity (hence why I’m even telling this long-winded story) so I was like “SWEET! THIS IS PERFECT!” I had automatically assumed that “The Drinking Episode” was going to be more technical- something about how drinking affects certain personality types differently… Perfect food for thought while abstaining from alcohol, right? Oh how foolish I was! 😀 So, I’m not going to lie, it definitely did the opposite of what I had originally hoped for and made me want a drink suuuper badly. (Dear champagne, I love you. But don’t worry- I absolutely didn’t!) Obviously as soon as the episode started and you guys started to explain the premise, I could tell that it was not really what I had imagined, but again- big believer in synchronicity- so I decided to stick with it. Running is drudgery for me in general, but listening to you guys have so much fun was definitely helping. Also, because Antonia may appreciate this, I just moved up to Vancouver, Washington recently so I happened to be running along the Columbia river. So suddenly about 4 miles in, and totally unexpectedly, Antonia starts alluding a little bit to her history. “Oh I relate to that!” And then a little bit more “Wait… I really relate to that…” And then she says the word “shun” and I literally came to a sudden full on dead stop in the middle of Wintler Park and threw up my hands and tears started to pour down my face. Just hearing that you went through the same thing as me was incredibly cathartic for me at that time. I thought about writing a comment then but… didn’t. Ha. Introvert problems. Still I secretly hoped that you might talk about your experience more on the show at some point. So I was really happy (well not happy actually- something more like… moved?… touched?… profoundly affected?…) to wake up to an email about these two episodes. Short story long… Thank you so much for sharing your story. I haven’t heard it all yet, but I know beyond a shadow of a doubt it will help me untie some of these knots I’ve been holding onto. Somehow that makes all the difference. P.S. Edgefield is also on my bucket list. I hope it was amazing! After listening to this week’s podcast (pt 2), it reminded me that I was going to leave a comment on this one. I think at the end Joel mentioned that he would love to hear how people who have lost their parents go about making peace when the chance is gone, and I wanted to share what I did that brought me ultimate closure. Especially, hearing about how Antonia’s trip actually ended up going. I lost my dad last Thanksgiving. But before that, he had been in the hospital in June, and I too, took the opportunity to talk with him, worried that I wouldn’t get the chance. He justified his choices (mainly about health) and I made sure to tell him my feelings (of love and gratitude, and even some frustrations.) I wasn’t exactly satisfied with the interaction, but I had found a certain level of peace, in knowing I tried and that I had this somewhat hard and awkward conversation. Fast forward to him getting sick at Thanksgiving, after months of him making incredible (for him) lifestyle changes. I did everything I could to show him love in his final days. But, when he died, I still felt cheated, angry, and heartbroken for him. Angry, mainly because he had indoctrinated us kids (for a long, long time) to be prepared for him to die young, and had purposely disconnected himself emotionally from us in hopes we wouldn’t mourn his loss. Unfortunately, no conversation makes up for lost time. What helped me process it was writing it all out. I wrote a letter to him, but also to myself (specifically the inner child who was hurting from losing her dad). My resentment was of lost time and this grief that my dad never transcended his pain. Of course, we pick up certain behavior patterns that are modeled by our parents, and his was to withdraw/disengage. One that I am all too good at. What helped me find peace was knowing he lives on through me. His literal genes, humor, good and bad traits live on through me. So even though he’s gone, he’s still with me through biology and memory. And even though he didn’t over come certain hurdles in *his* life, by doing the best I can in *my* life, transcending those negative behaviors, healing my hurts, and living my life to the fullest potential- I can, at the very least honor his memory. So maybe (hopefully) my story will help someone else. I discovered your podcast early this year, and to be honest, I was able to find peace with what happened, because of your podcasts. So thank you! You two are amazing people and I am incredibly grateful for what you all do. Oh boy, what a relevant and important podcast. My Dad passed away in June and I was fortunate enough to make as much peace with him as I could before he passed. Before he died, I went about getting to know him as a man and as a human being. Because of that, I felt far more compassion and love for him than I have in my life. He was probably not fully aware of what I was doing and I felt like he wouldn’t fully understand why I was connecting with him. I didn’t like him most of the time and much of my inner rage stems from my early relationship with him. Forgiving him was helpful in forgiving myself for not being the person I really wanted to be. Thanks for your courage and vulnerability during the podcast. Not accidentally, and thank you to the Powers that be, I heard this podcast the day before I had one of those come-to-Jesus discussions with my father. He’s 87, has Parkinson’s, cancer, and a variety of other maladies. He also has a girlfriend, a girlfriend who is his mistress during my mother‘s life. So my first comment to her about my mother, who is an alcoholic when I was a child. She got sober after I moved away, but obviously that leaves some discussions that needed to be had. I was blessed to be part of her last year. We had so many important discussions! We laughed and cried and faught and sat in silence holding hands. As the cancer progress to her brain, she clung to me for support. I slept in the bed with her the last six months and she would wake up and look at me in amazement, stroke my face, and say, “you’re here!” That’s really enough to tell me that time is it very sure way of healing old wounds. But we don’t always get that gift. So my father cheated on my mother with the woman who is now his girlfriend. She was the secretary in his office, and used the power of balancing his checkbook and credit cards to control my mother for 40 years. Since my mothers death, she has attempted to use the same tactics on me. We had a lot of ups and downs, but I believe that I was put in this position to get to know my father is a human being. Not as a less than perfect husband, not as a why-didn’t-you-love-me-more-Daddy Father, but simply as a man who did the best he could Father, and wishes he could’ve done better. Don’t we all? So, through personality inventory training ( I’m certified in Myers Briggs), I now understand a lot more about how we are all doing the best we can at any given moment. And I took that with me to the meeting with my dad and his girlfriend. That’s what makes the difference in life. Believing that everyone is doing the best they can and will help you allow love. Everyone wants to be valued, and everyone wants to feel good about where they are. Allowing people to be where they are, allowing people to be who they are without judging, knowing that we are all doing the best we can it’s a place of peace and love. So thank you for letting me post this rambling diatribe about my parents. I’m sitting in the bathtub but they have a coffee which is where I sit every day when I listen to this podcast, crying :-), which is what we need to do sometimes. This podcast was very timely for me. I have felt this mounting pressure that if I want to grow, then it is important and necessary for me to have this type of conversation with my dad. However, I don’t know where to begin. I don’t want to bring a bunch of blame, but I also wonder how do you clear the air without bringing up the raw offenses like “you weren’t there for me” and “I don’t feel loved by you”, that love we all want that Joel was talking about. I value deep, honest relationships and I want him to know the real me. Maybe it’s just an ideal fantasy that I could have that kind of relationship with my dad, and I need to find some way to move forward and salvage whatever time may be left? Since I was a child I have felt that the entire burden of having a relationship is on my shoulders. On top of this he is a functioning alcoholic, so it’s rare to catch him sober to even be able to have a meaningful conversation. I felt deprived of a dad, the one I have is not the one I would want and I feel guilty for feeling that. I do care about him… he’s my dad after all. But I guess I’m angry because I feel like I have to be the parent with the one person in the world I shouldn’t have to. Someone recently reminded me that it takes two people to have a relationship. It was partially a freeing thought, because I realized I can only do my part. Perhaps that’s what this is about, making a “real” last -ditch effort so that I feel confident that I have done my part. Or maybe it’s just about forgoing my own needs and doing my best to communicate the “yes you are loved” while that is still an option even if I don’t get what I need reciprocated. I think I’m also afraid to discover that I’m really not loved enough for it to be reciprocated, which not surprisingly is a fear I carry into most relationships. Anyway, that was a very helpful perspective Antonia shared about not going in looking for a ROI, because it’s more about braving the process than getting the outcome you want. Thanks for your vulnerability in sharing this part of your life with us! I found this podcast rich with insight and helpful perspectives that stirred me on my own journey. I’d love to hear what helped others make the leap and have that difficult conversation with their parents. Was there anything that gave you the courage or made it seem like the time was ripe? Be sure to listen to Part 2 on Monday. I address a lot of these questions as a result of my trip home. Oh wow! Oh I hope this is ultimately healing for you and your family Antonia! This is such a brave thing to do. Looking forward to the update! Antonia, ironically I’m in Portland right now (coming from Phoenix) working through things on a self-imposed midlife sabbatical (51 yo), and independent of your podcast I started a deeper wave of working through parental (mostly mother) stuff. Recently getting through a layer of anger, in the last couple days I seem to be tapping back into some adolescent energy where I mostly did what I wanted, like listen to and jam to Rush. Rush was formative for me (as was sci-fi). Core albums for me were primarily 2112 through Signals, but Hemispheres has been my philosophical and musical go-to, one that I am still trying to play like Lerxst/Lifeson. The unification of mind and heart is my journey right now (intensively during the last 2-3 years) having had an over-developed Ti (INTP) while now I test as INFP/E4… it’s just taking years to uncover my shadows and rewire myself towards Se and Fi which feels like grasping in the dark but is very healing (and also triggering as I hit deeper buried traumas). In this I have almost entirely rejected my mind’s role, ‘wrote knowledge’, and the so-called wisdom of others in favor of groping somewhat blindly yet as authentically as I can. It is a rocky rebirth, especially the healthy differentiation from parents, which never happened in my adolescence or early adulthood. A couple years ago I spent 3 months with my parents after a lay off (which spawned a dark night leading to my recent intentional period of growth/healing), hoping to reconcile and connect at a much deeper level. I reached somewhat of a new place with my dad but it was still very strained with my mother who generally refuses to revisit the past. 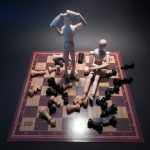 But after getting into coaching, I decided to take a ‘break’ from any significant interaction with them and my brother to break my co-dependent pattern in which I felt inadequate and largely disappeared in the family system. It was supposed to be for three months but has extended to two years, and I have felt like I can breath while I work on my healthy differentiation and HAT w/o onlookers/interpreters/”advisors”. At the same time guilt has been a battle (being a “bad son”), but I feel like I’m letting that go as I sink more into my truth — which includes owning my true feelings like anger, loss, sadness. I feel like I’m getting to a point where I could see them one-on-one again and “have the talk” which as Joel says airing things I don’t agree (alcohol usage leading to rage) while being willing to potentially be in the fire which I have avoided (and my dad modeled avoiding) my whole life. There is something about the raging/destructive feminine that had terrorized/terrified me my whole life, but I finally feel like I want to and can push back, not to also destroy but to say “that’s not acceptable, you don’t get to dump your pain on me.” It feels like moving from codependent submission and passive-aggression to finally standing up for my independent existence and sovereignty — while letting them be who they are. I would hope that would mean a more healthy and loving relationship, but it might mean that our ‘pain/love maps’ simply do not align, and I would have to get okay with that. I listened to Hold Your Fire practically on loop. Not sure why that one was my go-to this trip. Thanks — and to you. And to all of us willing to enter that territory! I am curious to hear how you will connect childhood issues to type. But Joel has quite a way with cliffhangers via email! lol really though, wanted to come and comment my feeling that this is truly important topic and thinking warmly of Antonia. I just downloaded this episode and am really looking forward to listening to it. As someone with a very difficult and complicated relationship with my parents, I’m looking forward to getting some perspective about making peace/coming to terms with them. Good luck, Antonia. You are in my thoughts. Hugs! Thank you for being honest with us and sharing your story. It’s a really raw issue for you and that makes it really authentic but at the same time it’s not easy for you and I appreciate that. My father passed away 3 months ago but I don’t think I have a big unresolved issue with him. There were things I was unhappy about as a child and a teen but I’ve made peace with a lot of it in my late teens. I live with my parents still despite being 23 and I’m nowhere near angelic so of course, trivial stuff do pop up every now and then but they’re nothing major. As it happened though, a week or two before he died, something happened that lead me to confessing my own personal struggle and my fears that I’m not good enough and that I’ll never be worthy but I’ve had conflicting feelings about it after he died. On one hand, I feel relieved that I’ve opened up my true self to my dad, something that I’ve had a problem with. I feel the need to be someone better with him and even in my most open moments with him, there is still a bit of reserve because I don’t want to disappoint him. On the other, when I confessed to him, there is this bit of hope in me that my dad would help me walk through this issue that I’m trying to overcome and when he died, I felt both abandoned and guilty. It’s not blame really, it’s just that I feel that part of me trying to cement the idea that I’ll never be worthy and that soon someone would be able to pull the drapers and see who I really am and just disappoint everyone. And when I start thinking of how I pull the spotlight onto me makes me feel bad. It’s a little different than what your topic is about but I think it’s at kind of little related. I still am glad that I ended up talking to him, maybe not about the hurt I felt when I was younger but I’ve already accepted, understood and been at peace with it but if I didn’t make that confession, I think I may feel even more like an imposter. I didn’t tell everything that I feel because I was so scared of disappointing him but I admitted that I was scared at that’s a big part of who I am. Unfortunately since my dad left us, there’s been a bit of a commotion. Only one of my dad’s five siblings are talking to us and the uncle who my siblings had been closest with is the most vocal with accusations and we’ve been getting snide comments from the cousins group chat. Personally I think that there are a lot of pent up guilt. My dad worked hard in a job that he felt very passionately about and he didn’t spend as much time with his family as a result. I know that they had expressed disappointment about it and a number of other issues and I believe that, not being consciously aware of that guilt, they only felt that something is wrong and are looking for someone to blame and it’s easier to blame the outsider who stole this man from their life. So I do understand where they come from as much as it hurts to be where we are. In a way, they’re trying to prove to my dad that they loved him but aren’t introspective enough to realise what they’re doing. And while this may sound twisted, I really am glad that I don’t end up feeling the same way and that I had made peace even if it was done by accident. I hope whatever the outcome Antonia, you are able to address your issue with your own parents and that come what may, you have done your best in trying to resolve it. I hope it all goes well for you and I think that it’s great that you’re taking the initiative yourself and you’re lucky to have such a wonderful partner. From the other side also thinking of you and hoping you’re going through the experience anchored in yourself and living through some meaningful moments. Sending you support from far away! Thank you Antonia and Joel for this personal episode. Antonia, I really appreciate you being able to share and speak so openly about your process. These are issues that are rarely talked about openly because there’s always some sort of facade needed, for one reason or another, yet so many of us are going through similar challenges and feelings, and need to find our way to deal with them with courage, as you do. It’s inspiring and comforting to hear you speak about it. Thank you!